How will a knee compression sleeve provide adequate knee support? Body Helix uses the latest advances in fabric science to make conventional knee straps, knee wraps, knee braces and tape obsolete. When you experience knee pain or swelling, our knee compression wraps will provide the knee support you are seeking. We offer a range of knee sleeves to provide a superior level of support for treatment of patellar tendonitis and knee sprains, knee strains, meniscus injuries, anterior and posterior knee injuries. Knee support for the knee ligaments (MCL, LCL, and ACL) can also be found in a Full Knee Helix. Why is the knee the most common site for sports injuries? The knee is composed of four different tissues: (bones, tendons, ligaments and cartilage. These components are commonly susceptible to injury because athletes put so much weight, force and stress on this small area of the body during repetitive and explosive activities. 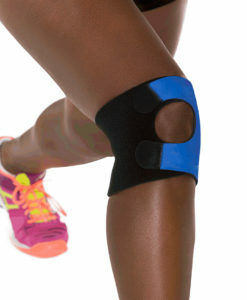 What is the difference between an adjustable knee and closed knee wrap? The Adjustable Knee Helix has an opening for the patella so there is no posterior pressure on the patella and with the velcro tabs, you can adjust the compression to your preference. The Full Knee Helix does not have a patellar window and unless posterior pressure is to be avoided, provides more support for the entire knee. Why should I choose a knee compression wrap? The knee is one of the most injured areas of the body, whether you run long distance, play a sport that requires jumping such as volleyball or basketball, perform heavy lifting, or are involved in any sort of strenuous activity that's hard on the legs. If you experience knee pain of any kind, especially pain directly behind the kneecap, you should consider a knee compression brace. Unlike other runner’s knee braces, a Body Helix knee sleeve is sure to not slip during activity, making it the best knee support offered today. 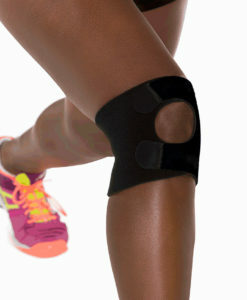 Those diagnosed with arthritis may also experience relief from knee pain with a Helix wrap. If you are experiencing pain in other areas of the leg you may want to consider our thigh wraps, ankle wraps or calf compression wraps.